Since the beginning, the focus has been on training conservative, safe pilots. Powered Paragliding can be a VERY safe sport as long as you follow a few guidelines. Midwest PPG is dedicated to teaching you these boundaries. We train and fly in the safest of conditions. We will never put a new pilot in the air when conditions are less than perfect. Remember, there are old pilots and there are bold pilots, BUT there are no OLD BOLD PILOTS! Matt began his aviation career in General Aviation and skydiving, but transitioned strictly to gliders in 2010. 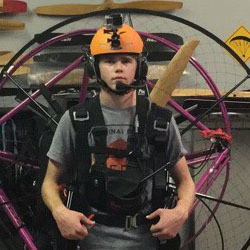 He was trained in speed flying and speed riding in California before learning paramotoring in 2015. He is a USPPA PPG3 rated pilot working towards his instructor rating and has been working with Dave since 2016. Jesse has always been interested in aviation. As a kid every once in a while a paramotor would fly over his house, but until last year he didn’t know what it was. Once he found out what it was, he was pretty quick to get involved and sign up for training. He likes the outdoors in general, and one of his other big hobbies is racing dirtbikes during the summer. Welcome to the team Jesse!